There are moments. Only moments in time. And these moments are nothing but flickers. All that is grief. All that is sorrow. All that is happiness or joy. Pleasure or pain. All that is bliss or woe. All that is anything is really nothing in the end but a short flare. A terse clip that is ultimately snipped and cropped and sliced and trimmed and cut and pasted back together again. Like some epic Technicolor film. Like some color light beam shot against a wall from a clacking projector. A stereopticon spraying instances and periods against the cold bare white. The chatter of a feed sprocket. The hot metal of a lamphouse. A director’s curly cut lying on some dead editor’s dusty floor. Your mother’s soft breast. The smell of her skin and neck and the beating of her heart. The palm of your father’s hand. The abrasiveness of his handkerchief as he wipes chocolate from your mouth. The warmth of his strong arms as he cradles you on the couch. The softness of your brother’s fingers as he draws pictures on your back. The first time he hits you with his fist. The redness of your cheek as the hot tears are wiped away. The first time your tooth falls out. The eagerness and expectation and ache and excitement of waiting to open up your presents at Christmas. The smell of wet dust in summer. The spray of sprinklers across your bare chest and legs. The green fresh fragrance of grass when it’s cut. The first time you sleep outside on the front lawn. The sound of wind through the cottonwood trees. The fire and magic and mystery of millions of stars high above you in a dark desert sky. The thick red blood on your knee cut from earth after falling from your bike. The vinyl seats on the school bus. Your tin Snoopy lunchbox. The first snows of November crossing Peavine Mountain in a powder-cloud of white. The snowdrifts against the Tholl fence. The hard snowpack underneath your skis. The pile of books brought home from the library on a cold winter afternoon. The warmth of the fireplace made from Truckee Meadow stones. The horror films late at night. The cartoons early in the morning. The sound of a basketball hitting a backboard. The first time something moves you. The first time someone doesn’t tell you what to do. The first time you question what you’ve learned. Your first hug. Your first kiss. The failed math grade. The lost games and races. The first time you throw up from too much alcohol at a party. Your first car bought from a junkyard. The Spanish guitar you learned how to play yourself. Your first essay and poem you wrote in English class. The first time you do something you weren’t supposed to do. The second time you do something you weren’t supposed to do. The Oakland Day on the Green. The hard work and frustration of trying to become and be somebody. The disappointment later of not having become that person. The realization in the end it just doesn’t matter. The first time you move away. The wonder and excitement of discovering mysterious lands you’ve never been to before. The beauty of seeing famous European art up close. The first time you weep on Piazza San Marco. The crucified grape stalks outside a train window in northern Italy. The towering white Alps. The ancient blue Aegean Sea. The crystal lakes and dirty Parisian streets. The notes you take jotting it all down. The first time you make love. The touch of a soft naked body. The smell of fresh bread in a bakery. The sticky Praline sweet licked from your fingers. The first time you fall in love. The first time someone breaks your heart. The hard cobblestone streets and limestone facades and flying buttresses and gray gargoyle faces of an old and dark Bernese city. The first time you lose someone you love. The voice of your father on the telephone telling you your mother has died. The disappointments and deaths and tragedies yet to come. The friends and family and loved ones and people you meet and hold onto along the way. The hot and essential love of the heart. The fire of the heart. The love that at times is the only one and true love. The essential reason that keeps you going. That keeps you moving. The muse and the passion and the beauty and the excitement. All the pain and joy and grief. All that is the visual and sensatory feeling that makes up this flimmer-filled full-length motion picture we call life. All these things. These short and amazing things. Soft flickers of light projected high above your eyes across a towering and vacant screen. If you look long enough. If you sit and truly look. You will see it all. 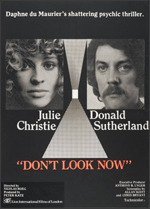 John Baxter (Donald Sutherland): Nothing is what it seems.